Last Friday at lunchtime, I joined a girlfriend and her two sons for a little adventure in uptown Charlotte. As the Panthers prepared for their California send-off, there was a lunchtime pep rally held in one of the large parks in center city. All five of us met at the lightrail station and took the "choo choo train" in to town (big adventure for Miss Camille) and had a great time seeing everyone decked out in their gameday gear getting stoked for the Super Bowl. They were playing great music and just getting everyone pumped up about the team. Later, the coach and some of the players made an appearance (but we had to leave before that happened). It was such a fun adventure that I wouldn't have attempted solo, so I loved that my girlfriend invited us along! We have fully transitioned our dining room over to our shared office space, and I love it. I don't miss our dining room at all. How did we live for four years thinking it was an absolute necessity? We ate in it maybe three times a year, and other than that, it was a holding ground for STUFF. Stack of catalogs I want to look through but not now? Dining room table. Stacks of daycare artwork from Camille? Dining room table. Paid bills ready to meet their demise in the shredder? Dining room table. My next task is switching out these standard knobs for some funkier pulls I found 50% off at Hobby Lobby. I'd love to share some photos of the new office space next week! For well over a year now, these girls and I have been getting together for a quick weekday lunch every 2 or so weeks. 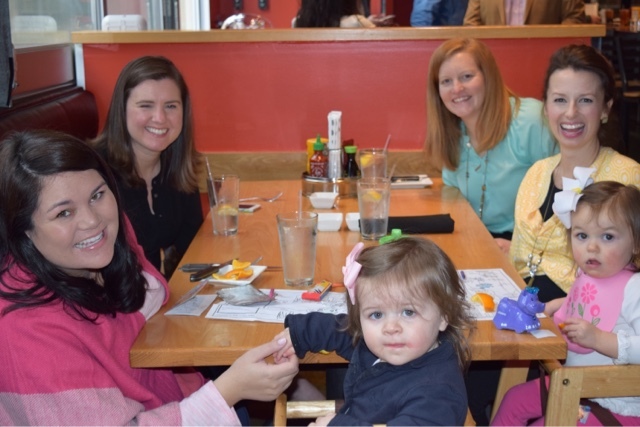 Sometimes the little ones join us (like this past week at Cowfish) and sometimes it's just us four gals. I cherish their friendship so much. I also cherish Cowfish's bento boxes. True story. Greek yogurts are a great choice for those with gestational diabetes, and I've tried several at this point. They are higher in protein than the traditional yogurt, which is the key factor to them being a good option. 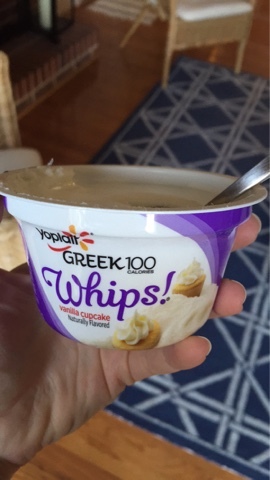 And oh my word, these whipped Yoplait yogurts are awesome. So far I've tried vanilla cupcake (!!! ), strawberry, and salted caramel, and they are all quite tasty! I mean really, stick a few cute things in there and you are all set: a fun beach towel for a beach bag, a cheese board and bottle of prosecco for a park picnic bag. You get the idea! That's all I've got this Friday, but just one more thing .... GO PANTHERS! I don't know much about gestational diabetes, but I do love Greek yogurt. The best kind that I have had so far is Dannon Oikos Triple Zero Greek yogurt. They have plenty of flavors and there is no added sugar in it! They are delicious! 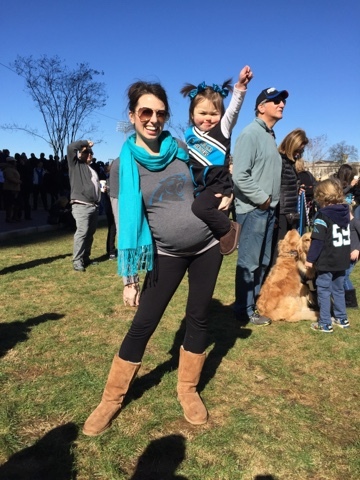 How stinking adorable are you and your bump in your panthers gear?! So excited for Sunday!! I love the cute Panthers outfits that you & Camille have been rockin' lately. Go Panthers! Have a great weekend! 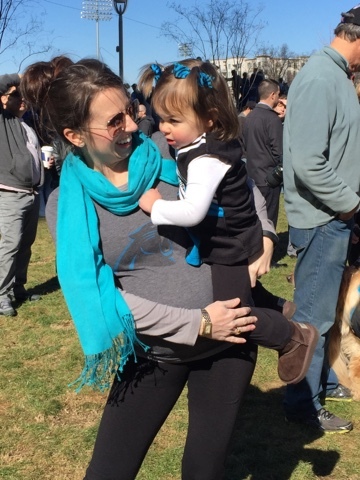 Oh you ladies look so cute in your Panthers gear! I love those market totes from Lily. Thanks for posting about them being on Amazon, totally off to buy more. Go Panthers!! I will totally have to check out Lily on Amazon...who knew!! Have a great weekend!! 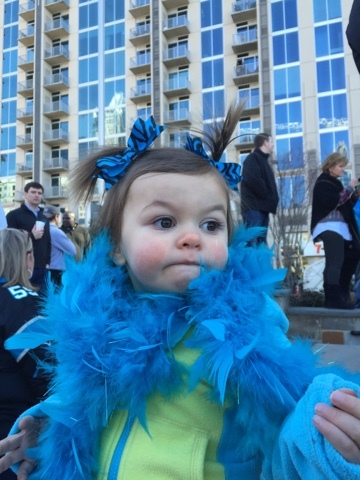 Camille in her Panthers gear!! I can't get enough, so cute. I'll be cheering them on for you all since my Pats didn't make it this year. I can only imagine how crazy Charlotte has been this week, when I feel like the Triangle is bursting with Panthers' pride too! 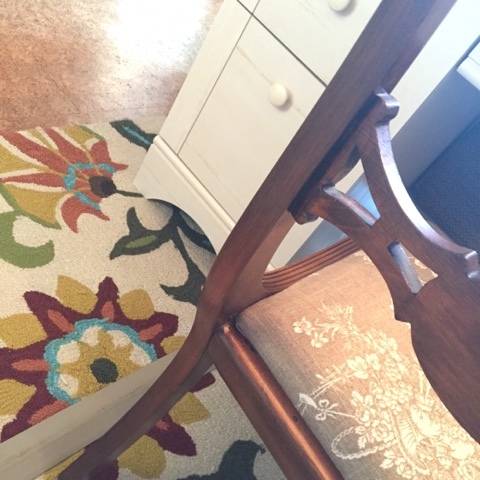 Thank you for hosting a fun Friday link-up! I look forward to reading more of your blog! We just moved to the Upstate, and I haven't gotten into the Panthers excitement yet, but that looks like a fun event! I love the idea of switching the dining room into a joint office - perfect! Good luck to your Panthers this weekend - can't wait for that game! 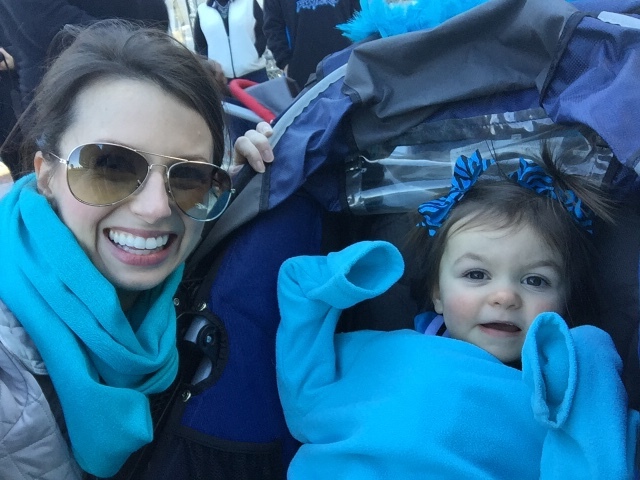 Love that you ladies do your meet ups sometimes just you and sometimes with the kiddos - great balance! I can't wait to see your office reveal! I love stuff like that so much! Also, if you like bananas you MUST try Oikos Greek Yogurt - Banana Creme Pie. I eat a LOT of Greek yogurt and I've tried a lot of different flavors from a lot of different brands, and holy moly, the Oikos Banana is BY FAR my favorite ever. It is SO. GOOD. Oooh! Can't wait to see your office reveal either! And could you be a cuter pregnant lady! So exciting for Panthers fans this year! And LP on Amazon! Heading over there now! Camille is too cute! 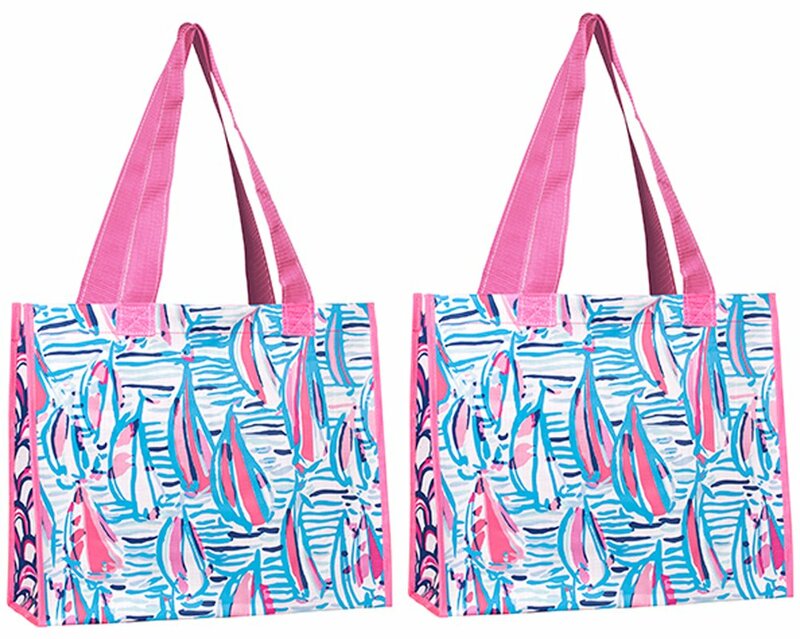 I love those totes; they would be part of a fun little summer or spring gift! Or maybe just to haul groceries! Amen to Cowfish bento boxes! I cherish them too! That last picture of Camille is too cute! Wish I lived closer so I could get in on all your fun social events with fellow bloggers! Ooh, I haven't seen the vanilla cupcake yogurt yet, I'll have to keep an eye out!